When asked about the Cocker Spaniel temperament most people think about the beautiful little dog from the Disney classic Lady and the Tramp. When it comes to choosing a family dog, there are few breeds that are more iconic than the Cocker Spaniel. Here is what you can really expect from this happy-go-lucky dog with the beautiful, flowing coat. 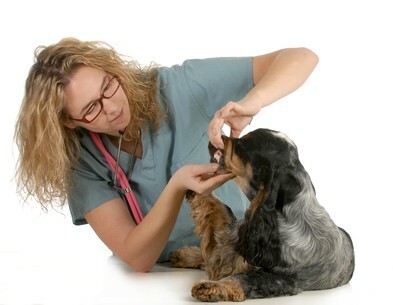 Weight: Cocker Spaniels should way between 24–30 pounds but they tend to gain weight easily and care needs to be taken to not let them get overweight. Age: Cockers can live to be between 11 and 15 years old. If you looked in the dictionary under “companionable” you might see a picture of a Cocker Spaniel. 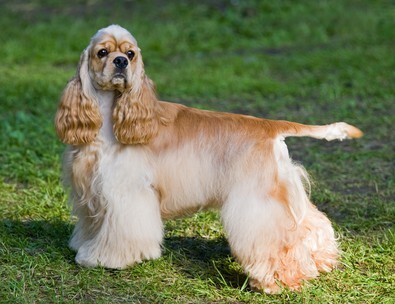 Everything about the Cocker Spaniel temperament makes them a wonderful family pet. Like the Golden Retriever and the Lab, Cocker Spaniels are extremely eager to please and enjoy learning. Because of their gentle nature, positive reinforcement is the only type of training that should ever be used with this sweet dog. One of the best things about the Cocker Spaniel temperament is their friendliness. In fact, to most Cockers there is no such thing as a stranger. Because of this, don’t expect the Cocker to be much of a watch dog. Cockers love to be busy! Cocker Spaniels belong to the Sporting Group and are still used as bird hunting dogs. This means that they enjoy a lot of physical activity and are very playful. A rousing game of fetch, especially if going after a ball thrown in a pond or lake, is a favorite Cocker Spaniel activity. These pretty little dogs bond very strongly with their family members and consider themselves an important member of the family. This loyalty is endearing but can lead to problems with separation anxiety. As a loving and loyal dog, Cockers do not do well when left alone for long periods. They get along with just about everyone, even young babies and other animals. Not only is the Cocker Spaniel’s temperament perfectly suited for life with children, their size is perfect, too. Unlike smaller dogs, they are sturdy enough to handle life around rowdy kids but not so big that they run the risk of bowling them over. Just like with humans, obesity on Cocker Spaniels can lead to many other problems and Cockers love to eat almost as much as they love to cuddle! Cockers are predisposed to both Hemolytic Anemia and Thyroiditis, both autoimmune disorders that can lead to serious health problems. Special care should be taken not to over-vaccinate these dogs as it can trigger an autoimmune response. Rage Syndrome is a term coined to describe unprovoked attacks on family members and was originally thought to occur in a disproportionate number of male Cockers when compared to other breeds. This has since been disproved. Rage Syndrome can appear in any breed. Even other normally docile breeds such as Golden Retrievers and Springer Spaniels have been diagnosed with it. Reports of happy, trustworthy Cocker Spaniels are much more the norm than reports of alleged Range Syndrome. Typically, Cocker Spaniel’s temperament leans more toward that of a teddy bear than a Grizzly bear. If you are looking for a dog with a lot of love and affection to give, the Cocker Spaniel’s temperament makes him a great choice.